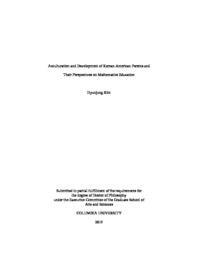 The purpose of this study was to investigate how parental beliefs, practices, and values of Korean immigrant parents regarding mathematics education in the United States are adjusted from the perspective of ecology of human development. This research further explored how participants’ cultural identities are affected by acculturation process. In addition, the researcher examined the transformations of parents’ perspectives on mathematics learning and achievement as they integrate into the dominant culture. The study used mixed methods to obtain information about the research participants’ experience as immigrant parents and interrelationships with their second-generation children regarding mathematics learning and achievement. A sample of Korean American parents (n = 44), whose children were currently enrolled in a mathematics course at the time or had taken at least one mathematics course within the past 3 to 5 years in middle or high school, participated in a quantitative survey; a subsample of immigrant parents (n = 10) participated in semi-structured interviews. The study utilized the Suinn-Lew Asian Self-Identity Acculturation Scale (SL-ASIA) and the Attitudes Toward Mathematics Inventory (ATMI). The results of the study indicated that even though Korean American parents shared the same nonnormative transition, they developed diverse intrinsic values and acculturation styles. Further, the parents’ perspectives on their children’s mathematical learning and achievement were influenced by traditional culture, dominant culture, and the interaction of both. The study also revealed that Korean immigrant parents used other Asian American students’ mathematical performance and learning as a frame of reference for their own children’s mathematical performance and learning; in addition, parents’ participation in children’s mathematics at home differed by acculturation levels. The main reason for the parents’ active support of and engagement in mathematics was that mathematics was the only subject which these immigrant parents adequately understood, and their aspiration for higher mathematics education was due to both immigrant optimism and pessimism. After moving to a different country, Korean parents’ abilities to perceive, conceptualize, and interact develop at different levels in new complex environments, where values, customs, and socioeconomic status contrast with those they had developed previously. These changes in intrafamilial processes and extrafamilial situations affected the development of the Korean immigrant parents’ cultural identity and reciprocal interactions with their second-generation children.